Let the Snapchat flattery continue, as Facebook began testing its imitation of Stories with select iOS and Android users in Ireland. Alex Heath of Business Insider reported that Facebook Stories is a virtually identical feature to Instagram Stories, also a “direct descendant” of Snapchat Stories. According to Heath, users add photos and videos to their Facebook Stories, which are visible for 24 hours, and that content does not appear in News Feed or on users’ Timelines. Friends can reply to Facebook Stories with direct messages, and selfie filters and geofilters (sound familiar?) are also available. Heath also pointed out that much like Instagram, the new feature is appearing at the top of the app for users in the test group. Facebook has long been the place to share with friends and family, but the way that people share is changing in significant ways. The way people share today is different than five or even two years ago–it’s much more visual, with more photos and videos than ever before. We want to make it fast and fun for people to share creative and expressive photos and videos with whoever they want, whenever they want. 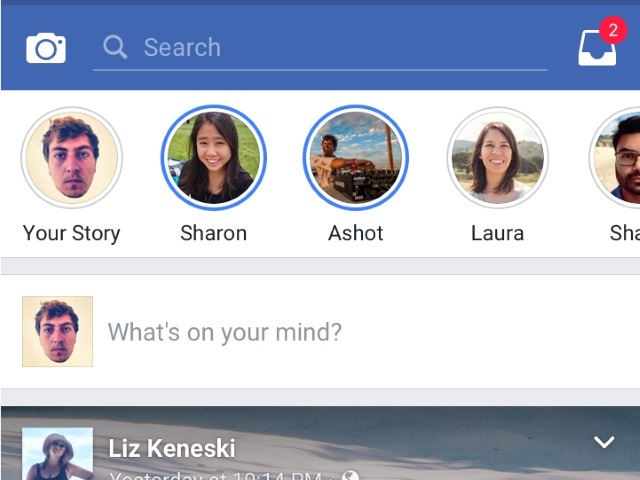 Readers: Would you like to see Facebook Stories launch? Image at top of post courtesy of Alex Heath, Business Insider. Images in body of post courtesy of Josh Constine, TechCrunch. Video courtesy of Napier Lopez, The Next Web.